Prefabricated Labour Quarter, manufactured by Droit-Exodus offers customers freedom from complexity of building a shed. It offers one stop solution for its clients, starting from designing to commissioning. 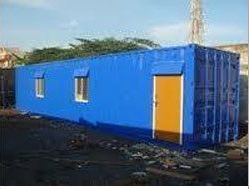 Droit Prefabricated Labour Quarter is a unique light weight steel building system suitable for sheds, residential houses, site offices, schools, hospitals, roof top shed etc.These sheds are made from high strength cold formed steel sections which are pre-galvanized making them more durable. Buildings made from this system are fire resistant and strong. It uses Durakolor Roofing & Cladding System for longer life. The installation system of Prefabricated Labour Quarter is very easy as, all components& parts are marked and are assembled using only nuts and bolts. It can be installed by even less skilled workers. It is light weight, thus it saves foundation costs and it is easy to transport even in remote areas.